Since 2009, 3rd Relation has been playing every Tuesday night at the Root Note in downtown La Crosse. It began as an open jam and has since turned into a cohesive group (trio, quartet, quintet, then quartet) capable of performing in a wide variety of settings. Though its members have changed throughout the years, the combo's goal of sharing jazz music and collaborating with other musicians has remained the same. The current 3rd Relation group is Greg Balfany (saxes), Karyn Quinn (bass), Luke Thering (piano), Brett Hulmer (drums). In December of 2012, 3rd Relation Quintet released their debut album, Tuesdays, a seven-track album with tunes such as "Milestones" (Miles Davis), "One by One" (Wayne Shorter), and "Windows" (Chick Corea). Hard copies of the album are available for purchase at the Root Note or through any member of the quintet. 3rd Relation performs every Tuesday, 8-11 p.m. at the Root Note. Other area groups Luke has played with (either as a substitute player or as a member) include: La Crosse Jazz Orchestra, Kies & Kompanie, the Michael Patrick Quartet, and Swing Inc.
Luke performs frequently in the La Crosse area as a solo pianist, primarily in the genres of jazz, blues, and pop. He performs the music of a variety of artists/composers including jazz composers such as Duke Ellington, Erroll Garner, and Bill Evans and more contemporary musicians such as Ben Folds and Dave Matthews. 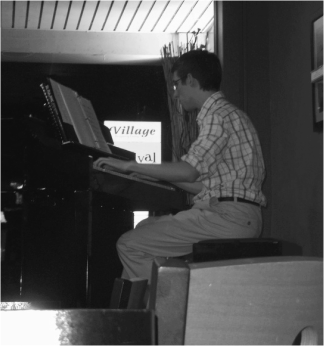 Musical influences and inspirations include such jazz pianists as Art Tatum, Bill Evans, Brad Mehldau, and Eldar Djangirov. To hear Luke's solo piano work, navigate to the Music page. September 2012. JavaVino, La Crosse, WI.